Who was Heir to the Throne in Europe (1815-1914)? 29 January – Richard Meyer Forsting was invited to contribute a talk Die Erziehung eines modernen, konstitutionellen Königs? Prinzenerziehung in Spanien im 19. Jahrhundert to the seminar series of the Institut für Geschichtswissenschaften (Lehrstuhl für Europäische Geschichte des 19. Jahrhunderts), at the Humboldt Universität Berlin. 2 November – Heidi Mehrkens gave a paper For Glory, Dynasty and Nation: Soldier Princes in Prussia and France (1830-1848) at the international conference Denmark, Scandinavia and Europe 1814-1848. Monarchies, Emotions, and Nations, 1-4 November 2017, Copenhagen. This event formed the final conference of the research project Impacts of the Danish Defeat of 1814. Political and Cultural Spaces of Communication in the Eras of Reaction and Scandinavism, based at the University of Southern Denmark. 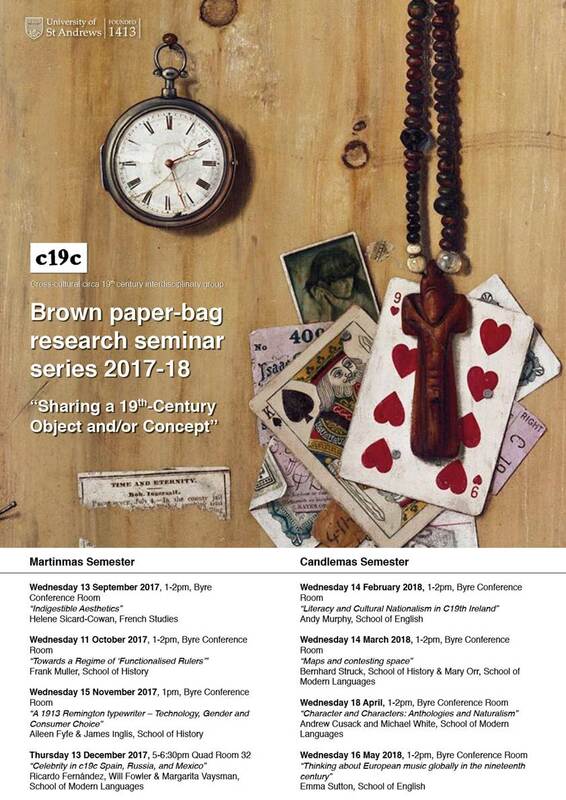 11 October – Frank Lorenz Müller shared his thoughts on the topic Towards a Regime of Functionalized Rulers with attendees of the interdisciplinary Brown paper bag research seminar series 2017/18 at the Byre Theatre St Andrews. 21 September – Heidi Mehrkens contributed a paper In dynastic no-man’s land: Archduke Ferdinand Maximilian of Habsburg and the throne of Mexico to the international conference The Modern Invention of Dynasty: A Global Intellectual History, 1500-2000, Birmingham University. 17 September – Miriam Schneider was invited to give a talk “Sea king’s daughter from over the sea”: Maritime heritage and the idea of a racial-cultural kinship between Britain and Denmark, c. 1863-1900 at the workshop Royal Danish Consorts in Britain, Royal Museums Greenwich. 19 April – Miriam Schneider was invited to give a talk Mit Königs um die Welt: Die Repräsentation der Monarchie im Reise- und Abenteuerroman des langen 19. Jahrhunderts at the Colloquium on Modern History, Gießen University. 20-21 April – Miriam Schneider contributed a talk “Path of the Dane to fame and might!”: The Danish monarchy and the realm of the sea from the 19th to 21st centuries to the international Conference Realms of Royalty: New Directions in researching contemporary European monarchies, Gießen University. 18 & 19 May – Frank Lorenz Müller gave a paper “A Modern Prince in the Best Sense of the Word”: Suggesting a Future for Imperial Germany’s Sub-National Monarchies at a workshop entitled Ruler Visibility, Modernity, and the Ethnonational Mindset, to be held at Aarhus University. 21 February – Heidi Mehrkens was invited to kick off the annual lecture series of the History Society, University of Aberdeen, with a talk Children of the Constitution. Heirs to the Throne in Nineteenth-Century European Monarchies. 11 January – Frank Lorenz Müller was invited to contribute to a colloquium at Berlin’s Humboldt University (Institut für Geschichtswissenschaften). He talked about monarchical futures in Imperial Germany: “Seinem Vater in der glorreichen Regierung nachfolgen”: Thronerben und die Zukunft der Monarchie im Kaiserreich. 23 August – Richard Meyer Forsting and Heidi Mehrkens gave a joint talk at the Conference ‘The Price of Peace: Modernising the Ancien Régime? Europe 1815-1848‘, University of Kent at Paris, Reid Hall (22 – 25 August 2016). The talk focused on ‘Heroic Heirs. 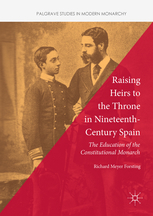 Monarchical Succession and the Role of the Military in Restoration Spain and France’. 10 February – Maria Christina Marchi was invited to give a talk at the IHR Modern Italian History Seminar, London (Senate House, 5:30 p.m.). The session was titled ‘Conceptualising the Italian South’ and her paper focused on ‘The Savoia and the South: Cultural Reinvention in Post-Risorgimento Italy‘. 4-6 February – Miriam Schneider contributed to the conference ‘Die Welt der Kinder: Weltwissen und Weltdeutung in Schul- und Kinderbüchern des 19. und frühen 20. Jahrhunderts‘, University of Zürich. She talked about aspects of monarchy and adventure using the example of Hohenzollern princes in youth books: ‘Monarchie und Abenteuer: Systemstabilisierung im Jugendbuch‘. 4-5 December – Maria Christina Marchi contributed to the ASMI-conference ‘Educating Italy (1796 – 1968 ca): Local, national and global perspectives‘. Her talk was on the topic of ‘Educating Royalty: The Making of Italian Princes (1860–1900)’. 9 September – 33,445,440 minutes, 557,424 hours, 23,226 days, 63 years, 7 months and two days. However you wish to measure it, on 9 September 2015 a long-standing record was officially broken. Her Majesty Queen Elizabeth II has become Britain’s longest reigning monarch (and the world’s longest reigning female monarch). She surpasses the reign of her great-great grandmother Queen Victoria. As scholars united in progressing research on the history of European monarchy, we offer our sincere congratulations to Her Majesty on reaching this historic landmark.Without long-reigning monarchs, our work as historians with a particular interest in the role of heirs to the throne would be much less rewarding. 27–29 August – Our second “Heirs to the Throne” Conference “Winning their Trust and Affection”: Royal Heirs and the Uses of Soft Power in 19th-Century Europe took place at the University of St Andrews. Download the programme here (PDF). 23 June 2015 – Maria Christina Marchi was invited to give a talk at the Post-Graduate Summerschool organized by the Association for the Study of Modern Italy (ASMI) at Reading University. She spoke about ‘“Their youth and grace will conquer those people more than reason or discourse could do”. Italy’s First Royal Wedding‘. 22 June 2015 – Richard Meyer Forsting attended the conference ‘The Configuration of the Spanish Public Sphere‘ at the University of Warwick and contributed a paper on ‘The Role of the Military in the Development of a Spanish Liberal Public Sphere’. 11 April 2015 – Richard Meyer Forsting gave a talk at the Fifth Annual Meeting of the Nineteenth Century Hispanism International Network, 10-11 April 2015 in Munich. His lecture was about ‘The Growing Importance of Educating an Heir in Nineteenth-Century Spain’. 13 November 2014 – Frank Lorenz Müller gave a talk (“Kronprinz Friedrich als Vertreter der Idee eines ‘Kulturkönigtums’“) at the Bode Museum (formerly: Kaiser-Friedrich-Museum) in Berlin to the members of the “Kaiser-Friedrich-Museums-Verein”. 14 November 2014 – Frank Lorenz Müller contributed a paper („Bismarck und der Kronprinz Friedrich Wilhelm“) to a symposium on „Bismarck and Liberalism“ organised by the Bismarck-Foundation (at Friedrichsruh) and the Friedrich-Naumann-Foundation. He also took part in the expert panel concluding the symposium. 7 November 2014 – Maria-Christina Marchi was invited to present a talk “Inventing the Contemporary. Umberto and Margherita: Italy’s Heirs to the Throne” at the SIS (Society for Italian Studies) Postgraduate Colloquium, at the University of St Andrews. 11 October 2014 – Frank Müller was invited to contribute a paper “Frau Deines Mannes, Tochter Deiner Mutter”: Mission und Scheitern der Kaiserin Victoria at the international conference “Perspektivweitung. Frauen und Männer machten die Geschichte Brandenburg-Preußens” in Charlottenburg Palace, Berlin. The talk can be found online (see Video file). 24 September 2014 – Heidi Mehrkens contributed to a panel “Fürstliche Verlierer? Europäische Monarch(i)en zwischen Niedergang und Behauptung im 19. Jahrhundert” (with Daniel Schönpflug, Jasper Heinzen, Torsten Riotte and Thomas Biskup) at the German “Historikertag” (23-26 September 2014) in Göttingen. Her lecture focused on the dynastic and political implications of vacant thrones in 19th century Europe (“Krone zu vergeben. Der politische und dynastische Wettstreit um vakante Throne im neunzehnten Jahrhundert”). 11-13 July 2014 – Richard Meyer Forsting and Carmina Lopez Sanchez both attended the conference “Kings & Queens III: Entourage” at the University of Winchester and contributed to the panel “Managing the Royal Household in the Nineteenth Century”. Richard’s talk was on the topic of “The continued importance of royal entourage in constitutional monarchies-the dispute over the entourage of the Infant Queen Isabel II in 1841 and the Bedchamber Crisis of 1839 in Britain”. Carmina contributed the lecture “Head of the Spanish Royal Household at the end of the nineteenth century”. 19/20 June 2014 – “Il Principe di Napoli: The attempted creation of a national identity in post-Risorgimento Italy” was the title of Maria-Christina Marchi’s talk at The Association for the Study of Modern Italy, Postgraduate Summer School 2014 (ASMI), University of Edinburgh. 17 May 2014 – Maria-Christina Marchi was invited to talk on “The Savoia and the South: The Prince of Naples as a ‘nationalising’ agent?” at the North East Scotland Postgraduate History Conference, University of Aberdeen. May 2014 – Frank Lorenz Müller talked about his current research (on the roles the last kings of Bavaria, Württemberg and Saxony played during their time as royal heirs) at research seminars at the universities of Potsdam (7 May) and Dresden (15 May). On 20 January 2014 Frank Müller, Honorary Fellow of the Historische Kolleg, gave a lecture “‘Zwischen ihm und einem Knecht kein Unterschied’? – Überlegungen zur Rolle der Thronerben im monarchischen Europa des 19. Jahrhunderts” at the Kaulbach-Villa, Munich. Heidi Mehrkens was invited to give a talk at the conference „Die preußisch-welfische Hochzeit 1913: Das dynastische Europa in seinem letzten Friedensjahr“ (Herzog August Bibliothek Wolfenbüttel, 11 – 13 December 2013). Her topic was “Die welfisch-preußische Hochzeit 1913 aus britischer Perspektive”. “Der Prinz am Steuerrad: Monarchische Mythenbildung im Zeitalter der Abenteuerliteratur” was the title of Miriam Schneider’s lecture at the workshop “Helden über Grenzen? Transnationale(s) Mythen und Heldentum von der Antike bis zur Moderne” (University of Mannheim, 27-29 September 2013). Miriam Schneider was invited to give a talk “Imperfect immaculates: Impaired heirs to the throne and ‘educational experiments’ in nineteenth-century European monarchies” at the Conference “Imperfect children” (University of Leicester, 6 September 2013). 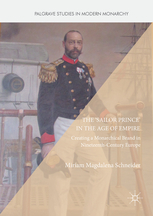 Miriam Schneider gave a talk “‘A Prince who is also a Sailor is sure to command the sympathies of his countrymen’: Prince Alfred and the invention of the public persona ‘Sailor Prince’” at the Conference “Navy and Nation: 1688 to the present”, Royal Museums Greenwich, 25-27 July 2013. On 13th June Miriam Schneider gave a talk at Würzburg University in Professor Grypa’s seminar “Hof und Gesellschaft im Deutschen Bund”. Her lecture was about “Mythos und Marke – Das Phänomen ‘Matrosenprinz’ im Zeitalter des Imperialismus”. In Potsdam’s “Villa Quandt” on 8 June 2013, Frank Lorenz Müller gave a paper and was interviewed on the occasion of the launch of the German translation of his biography of Emperor Frederick III. On 7 June 2013 Frank Lorenz Müller gave a public lecture at Berlin’s “Urania”. He spoke about the myths surrounding the life and legacy of Emperor Frederick III. “To the Empire’s ends: Nineteenth-century ‘Sailor Princes’ and the contact zone of the sea” was the topic of Miriam Schneider’s talk at the conference “Les espaces frontaliers: Zones de contact/zones de conflit? Border spaces: Contact areas/conflict areas? Grenzräume: Kontaktzonen/Konfliktzonen?” (Université de Liége, 25-26 April). Miriam Schneider gave a talk at the Landesarchiv Schleswig: “Auf der Kommando-Brücke steht der Hohenzollern-Admiral: Prinz Heinrich als Populärgestalt im Deutschen Kaiserreich” (10 January). This talk formed part of a lecture series launched by the Landesarchiv Schleswig on the occasion of the 150th birth anniversary of Prince Henry of Prussia, the first German “Sailor Prince”. For more information please click here. “Ferdinand Philippe von Orléans: Ein Todesfall und ein fragiles Regime (1842-1848)” was the topic of Heidi Mehrkens’ lecture given at the workshop “Geboren, um zu herrschen? – Gefährdete Dynastien in interdisziplinärem und interkulturellem Kontext”. The conference was hosted by the SFB 923 “Bedrohte Ordnungen”, Eberhard-Karls-Universität Tübingen (7-8 December). For more information please click here. Frank Müller and Heidi Mehrkens gave a joint talk at the conference “Royal Loss: Untimely deaths, public and private mourning, and the monarchs who never were” (University of York, 10 November). The paper compared the public reactions to and reflections generated by the untimely deaths of two royal heirs of the leading constitutional monarchies of 19th century Europe: “Dashed Hopes and Mourned Prospects in France and Germany: Prince Ferdinand Philippe of Orléans (1842) and Emperor Frederick III (1888)”. For more information please click here. Miriam Schneider was invited to give a lecture at the international conference “European Constitutional Monarchies” (23-24 August, Rosenborg Slot, Copenhagen, organised by SAXO Institute, University of Copenhagen and The Royal Danish Collections, Rosenborg Castle). Her talk focused on “‘Young, brave, and true he wears the blue’: The Concept of the ‘Sailor Prince’ in Nineteenth-Century European Monarchies”. Frank Müller gave a talk at The Berlin Review of Books@Summerhall Lectures on 10 August: “The Prince Consort Revived – The People’s Kaiser – The Prussian Hero: Myth-Making and Emperor Frederick III”. For more information please click here.